Comics are, most often, a blend of words and images interwoven to produce a whole story. There is a certain alchemy to the process of comic making. And while there is no right or wrong kind of comic, the storytellers must know what it is they want to accomplish on their pages. That is why a well-structured script is essential. It not only establishes a strong foundation for the words, but also for the images, and is essential for a story’s success. Through exercise, discussion, and analysis of comic professionals like writers Alan Moore, Warren Ellis, and Garth Ennis and writer/ artists like Craig Thompson and Brian Lee O’Malley, students will find the advantages of scripting their stories and learn the fundamentals of a complete comic narrative. In the twenty-third episode host DANNO KLONOWSKI speaks with Milwaukee cartoonist MATT CHIC. In an ever-increasing state of drunkityness our heroes discuss Matt’s NIGHT LIGHT COMICS, the perils of mini-comics, the 200+ page graphic novel EGYPTIAN SHUMBA he’s finishing this year, his cool dad, why Milwaukee ain’t so bad (but their cartooning scene is no Minneapolis), and whether or not Stan Lee is just a misunderstood capitalist. Or something. You are about to hear two men speak from their souls about making comics and stuff. Interstitial drink refreshment music provided by Chic’s band DADS. 7000 BC will be a part of the first Roswell Cosmic-Con & Film Fest, June 22–24, in Roswell, NM (yes, that Roswell). Stop by to check out comics from group members — and catch some movies and meet celebrities. BAD CARTOONIST NIGHT at The Bad Waitress is Monday, June 25th!!! 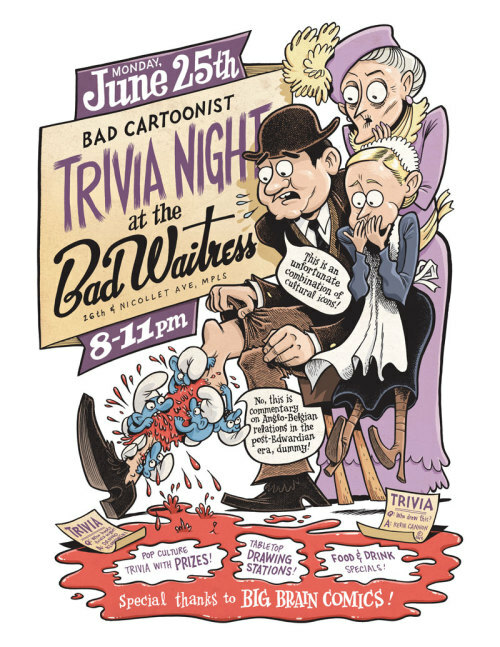 BAD CARTOONIST NIGHT at THE BAD WAITRESS is Mon, June 25th. KEVIN CANNON outdoes self once again!!! Besides putting on the annual comic art show (like this year’s Lutefisk Sushi event, deadline September 15th), Altered Esthetics gallery somehow manages to put on a show every month… which is incredibly impressive for a non-profit, community-run gallery. You can keep up with all of their open calls for submissions here. Another event many of you may want to consider submitting to is the Creative Property show (deadline July 15ht). The show features a look at the issues surrounding and the boundaries of intellectual property ownership, issues that are certainly often on the minds of cartoonists. Can a person claim ownership of an intangible asset? Artists face the issues of copyright and trademark as they relate to originality and creativity. Did you know they have live drawing sessions every month at Altered Esthetics (third Wednesdays)? Well, they do. In costumes! Another of the many reasons to love AE. Info below. Time to suit up! Join us every third Wednesday of the month for an evening of figure drawing …in costume! Volunteer models will suit up in a costume that best fits the theme of the month. This months suit up is titled “Cleanin’ out the Closets”. Our models this month will be suiting up in some of their old threads that most likely should have been donated to goodwill long ago. If you want, you can model too, the help would be greatly appreciated! No previous experience is needed, just a laid back attitude. We will draw a variety of poses, for what is sure to be a pleasurable evening of figure drawing with a twist. Bring your sketchbook & drawing implement of choice. Suggested Donation 3$. Lutefisk Sushi E call for minis! Lutefisk Sushi E is coming this fall! Want to participate? Yes! I know you do. All Minnesota artists are invited to submit work. Here are the guidelines. All you have to do is follow them, and turn in your mini-comics by September 15, 2012. If you aren’t already familiar with Lutefisk Sushi, visit cartoonistconspiracy.com/sushi/history to see its previous incarnations. 2. Make 160 consistent copies of your mini-comic. 4. Deliver or mail your contract and mini-comics to: Altered Esthetics, 1224 Quincy St NE, Minneapolis, MN 55413 no later than Saturday, September 15, 2012. 5. If you want to show off your original art in the Lutefisk Sushi E exhibition at Altered Esthetics, drop it off by Saturday, October 27, 2012. Artwork must be wired and ready to hang! No glass, please. Be sure to label your artwork with the title, your name, and price. 6. Bring all your friends to the opening reception on Friday, November 2, and the artists’ discussion on Saturday, November 17. Participants will receive one free Lutefisk Sushi E box per submission. We welcome collaboration! However, since supplies are limited, participants working with a friend or a team to produce a mini-comic will receive one box to share. If each participant wants a box, they will be available for purchase during the exhibition. Who? YOU and some Conspiracy friends! What? A social gathering for the purpose of trading unwanted comics! Where? Northeast Minneapolis! See contact below! Why? Clearing out unwanted comics and graphic novels and turning them into new reading material! When? Friday June 22 from 7:00 – 9:00 PM! How? 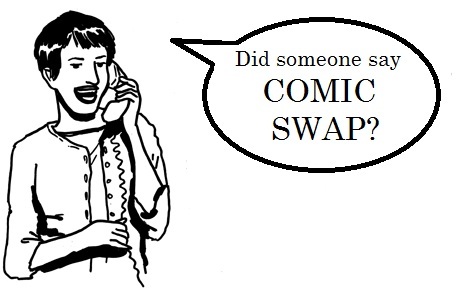 Email comicswap@trashmail.net to get the address and/or directions!